I was asked to assist and provide Dan Sleet (director of coaching) from Elite Preparation Centre with some fresh photographs for their website. As my son plays in their Development Centre I would be there watching my son playing so it wouldn't be much effort to bring my camera and lenses along. I've been shooting football action shots for around 4 years so it wouldn't be too difficult to produce in good light. The challenge was going to be the poor lighting provided by the flood lights. The flood lights for a human eye with a dynamic range of 20 f/stops, after 30 minutes it would be fine, but for a camera with a dynamic range of 10 f/stops it means that any form of photography without a flash would be next to impossible. In my bag today was my Canon 60d and Canon 7d , f2.8L 70-200mm IS, f4L 24-105mm IS, Canon 550ex flash and Canon External battery pack CP-E4. The ambient light fades fast this time of year so before it vanished I began shooting some action shots. I set the lens to F2.8 around 1/1000 ISO 2500 and even though the camera noise at ISO 2500 on the Canon 60d, it still produces useable photos, I didn't want to push any higher. My only option was to reduce the shutter speed and once you go below 1/640 fast movement it begins to blur. I had to adjusted from fast running action shots to take slower action shots, i.e : close control and holding the ball up. Slow movement from the players will produce a much sharper action shots at 1/640. One other thing you have to take in to consideration, is that you can't take photos with the flash on while the players are being coached. This only distracts them and may cause an Incident. Along with the action shots, Dan required some environment photographs of them conducting their coach classes with the boys and girls paying attention. With the ambient light gone I had placed the Canon 530 flash on the hot shoe. I would love to shoot with an off camera flash but with time constraints, room and continue movement of the coaches and players I just couldn't carry everything and take the pictures, perhaps an assistant would of helped. Next week, you will see me taking photos at their Goalkeeping course, plus the Futsal in a sports hall, which will hopefully have better light. If you have any questions, or if you would like me to take some sports photographs at your events please call or email me on the contact details below. 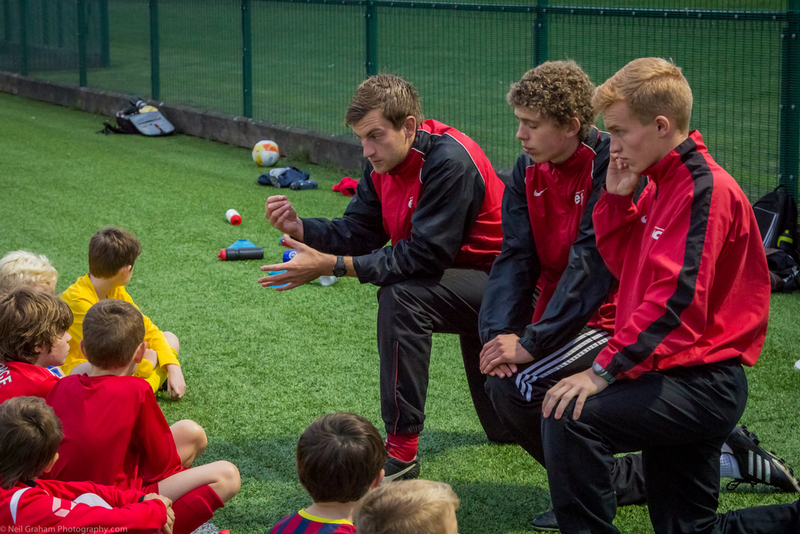 Helping Young Players Develop their Skills, Ability and Confidence.